The Italian viola da gamba soloist and conductor Vittorio Ghielmi is compared by the critics to Jasha Heifetz (Diapason) for his virtuosity and described as ‘an alchemist of sound’ (Diario de Sevilla) for the intensity and versatility of his musical interpretations. He attracted notice while still very young for his new approach to the viola da gamba and to the sound of early music repertoire. Ghielmi was born in Milan, Italy, where he began his study of music with the violin and later the viola da gamba. He studied the viola da gamba with Roberto Gini (Accademia Internazionale della Musica, Milano), Wieland Kuijken (Conservatoire Royale, Bruxelles) and Christophe Coin (Paris). Associations with instrument maker, engineer and humanist Luc Breton (CH), as well as with many musicians of non-European traditions (India, Afghanistan, Africa, Latin America) have been fundamental to his musical career. In 1995 he was the winner of the Concorso Internazionale Romano Romanini per strumenti ad arco (Brescia). For his fieldwork within old musical traditions surviving in forgotten parts of the world and bringing new perspectives to the interpretation of European ‘early music’ he received the Erwin Bodky Award (Cambridge, Massachusetts USA 1997). Ghielmi is one of the few viola da gamba players regularly invited to appear as a soloist with orchestra. As soloist or as conductor he has appeared with many of the world’s most famous orchestras in the fields of both classical and ancient music (Los Angeles Philharmonic – performing a Graun Concerto in the Hollywood Bowl – London Philharmonia, Wiener Philharmoniker, Il Giardino Armonico, Freiburg Barockorchester etc.). He performs recitals in duos with his brother Lorenzo Ghielmi and with Luca Pianca and has performed many of in the most important venues (Musikverein Wien, Philharmonie Berlin, Concertgebouw Amsterdam, Casals Hall Tokio etc.). He has shared the stage with artists such as Gustav Leonhardt, Cecilia Bartoli, Andràs Schiff, Thomas Quasthoff, Viktoria Mullova, Giuliano Carmignola, Christophe Coin, Reinhard Goebel, Giovanni Antonini and Ottavio Dantone. 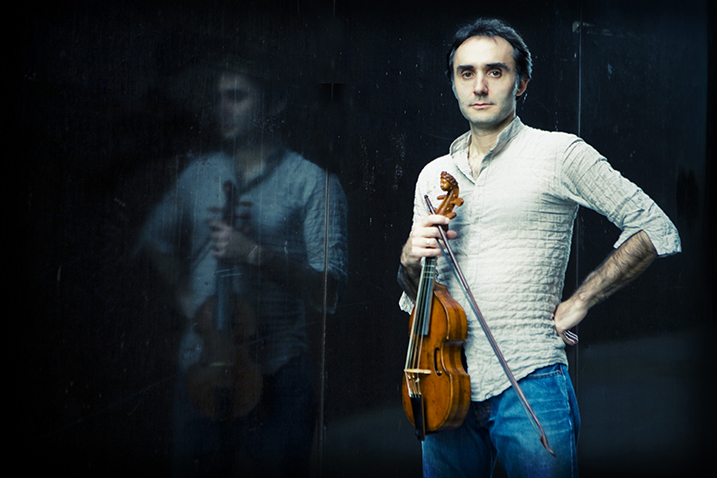 Ghielmi has been invited to play the world première of a great number of new compositions, many of which have been dedicated to him (Kevin Volans, White man’s sleep, Teatro Regio di Torino; Nadir Vassena, Bagatelle trascendentali for viola da gamba, lute and orchestra, Philharmonie Berlin, 2006; Uri Caine Concerto for viola da gamba and orchestra, Amsterdam Concertgebouw and Bozar Bruxelles, 2008; Caine Concerto per viola da gamba, basset-horn and Orchestra, Passau 2012). From 2007 to 2011 Vittorio Ghielmi was assistant to Riccardo Muti at the Salzburg festival. In 2007 he conceived and conducted a show, based on Buxtehude's Membra Jesu nostri, with the American film maker Marc Reshovsky (Hollywood) and the Swedish choir Rilke Ensemble. The project was produced by the Semana de musica religiosa de Cuenca (Madrid) and presented at Musikfest Stuttgart in 2010. In 2009 Ghielmi gave a performance of Forqueray’s complete works for viola da gamba at De Bijloke, Ghent (Belgium). He has been artist in residence at Musikfest Stuttgart (2010), at the Segovia Festival (2011) and Bozar, Bruxelles (2011). In 2012 he conducted Handel's Water Music at the Portogruaro Festival (Venice), with a spectacle on the river Lemene conceived by Monique Arnaud. His ensemble, Il Suonar Parlante, appearing both as a viols quartet and as an orchestra, is devoted to a new investigation of the early music repertoire as well as to the creation of new musical realities. Doing so the ensemble has performed with important jazz players such as Kenny Wheeler, Uri Caine, Paolo Fresu, Jim Black, Don Byron, Markus Stockhausen, Nguyen Lê and Achille Succi’, with jazz and blues singers such as Cristina Zavalloni and Barbara Walker, with pop singers like Vinicio Capossela, and with flamenco stars such as Carmen Linares. Several jazzmen and composers have written new music for Il Suonar Parlante. The ensemble also collaborates with traditional Asian musicians like the Afghan virtuosi of Ensemble Kaboul (Khaled Arman). Ghielmi’s collaboration with traditional players and in particular with the Sardinian traditional singers of the Cuncordu de Orosei is documented in the film The Heart of Sound, BFMI (Salzburg-Hollywood). He has made many price winning recordings (for labels such as Winter&Winter, Harmonia Mundi, Teldec, Decca, Sony, Auvidis, Opus 111, Passacaille) covering all the different musical styles in the viol repertoire. Four CDs are dedicated to the virtuosic gamba concerti by Johan Gottlieb Graun (1702-1771) performed with Ensemble Baroque de Limoges, Wiener Akademie, Il Gardellino and Il Suonar Parlante. His next productions will be appearing for Deutsche Grammophon. In addition to his activity as an instrumentalist and conductor, Ghielmi has often been in demand as an arranger and composer. He is professor at the Mozarteum in Salzburg and at the Conservatorio Luca Marenzio (Brescia). He regularly gives masterclasses in academies and universities all over the world. At the Politecnico della cultura, delle arti e delle lingue in Milan he has organized a series of conferences and concerts focused on the early music instrumental techniques and their survival in ethnic musical traditions. Ghielmi has published studies and articles on music and previously unpublished scores (Fuzeau, Minkoff, Ut Orpheus), as well as a method for viola da gamba known thoughout the world (with Paolo Biordi, ed. Ut-Orpheus, Bologna). He is currently publishing a complete edition of the viola da gamba concertos by Johann Gottlieb Graun and directs the musical research of Libroforte-Fine Music Editions. Vittorio Ghielmi plays a bass viol made by Michel Colichon, Paris 1688.